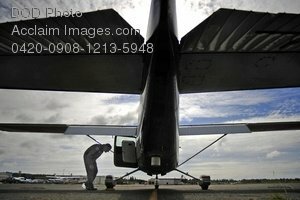 Description: Free, public domain image: Air Force Colonel Doing a Pre-flight Inspection on a C-182 Cessna. Civil Air Patrol Lt. Col. Wayne Schulz conducts preflight checks on a C-182 Cessna before departing Astoria, Ore., in support of Amalgam Dart 2009, June 18, 2009. Amalgam Dart is a field test of the Department of Defense's ability to rapidly deploy an integrated air defense system in the United States. (U.S. Air Force photo by Staff Sgt. Jacob N. Bailey.